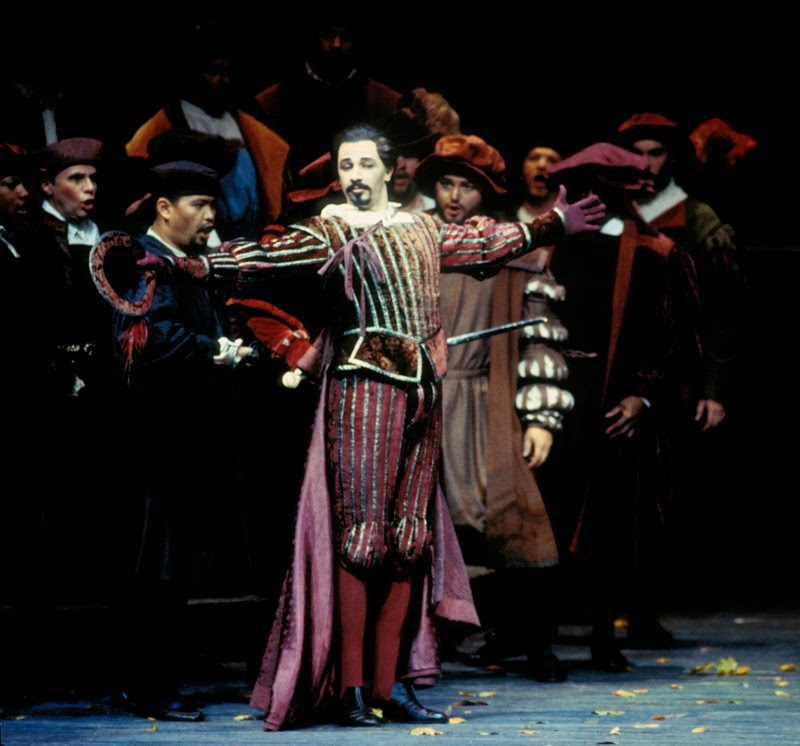 The other night we snuck into Greer Grimsley’s dressing room—after Tosca had given him her fatal kiss of death—and showed him a series of photos chronicling the many fine performances he’s given us at Seattle Opera. Greer shared memories of the wonderful colleagues who appear in these photos and spoke about some of the challenges of bringing great opera to the stage. Ha ha ha ha! This was my first show here! I remember it vividly; I was so excited to get to work here in Seattle. 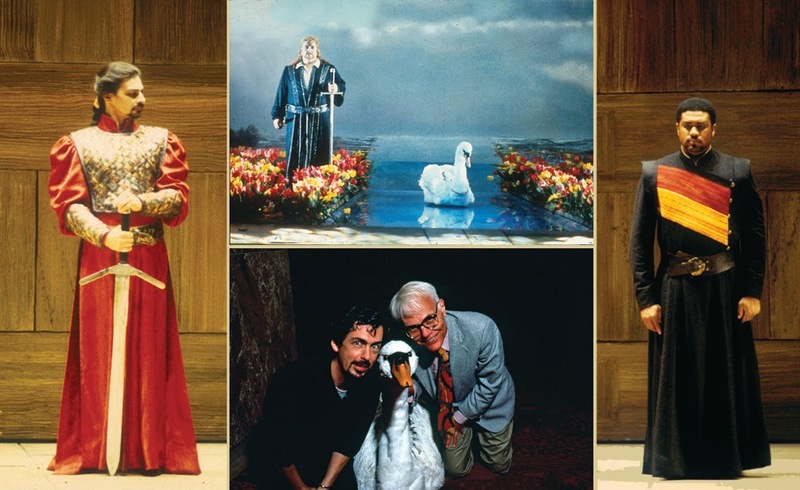 I loved this costume, which Marty [Pakledinaz] designed—and I remember the robotic swan, and Ben [Heppner, who sang Lohengrin], and Gordon [Hawkins] as the Herald, who was awesome. That prop sword weighed as much as a real broadsword. It always bothers me when people look awkward handling props, so I always had that sword, carrying it with one arm, so it would look natural. 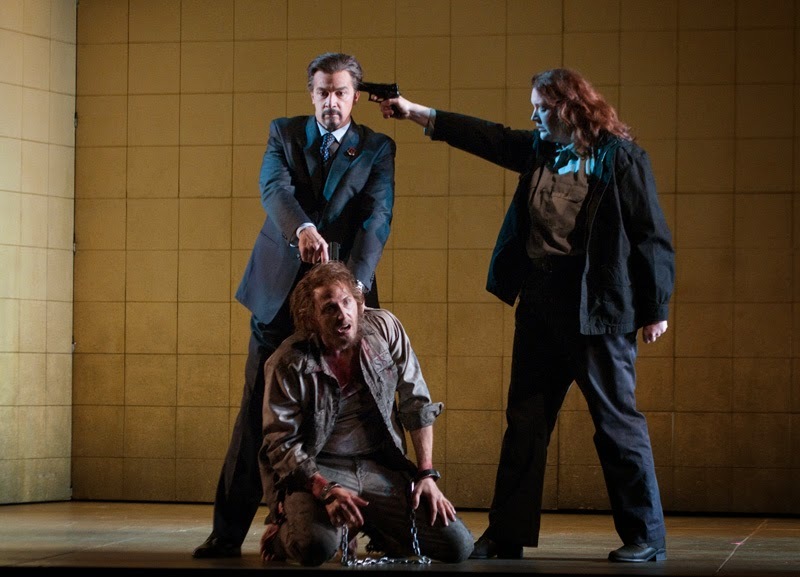 That was my first Wagner role, and it’s all thanks to Speight [Jenkins]. He started me down this road. 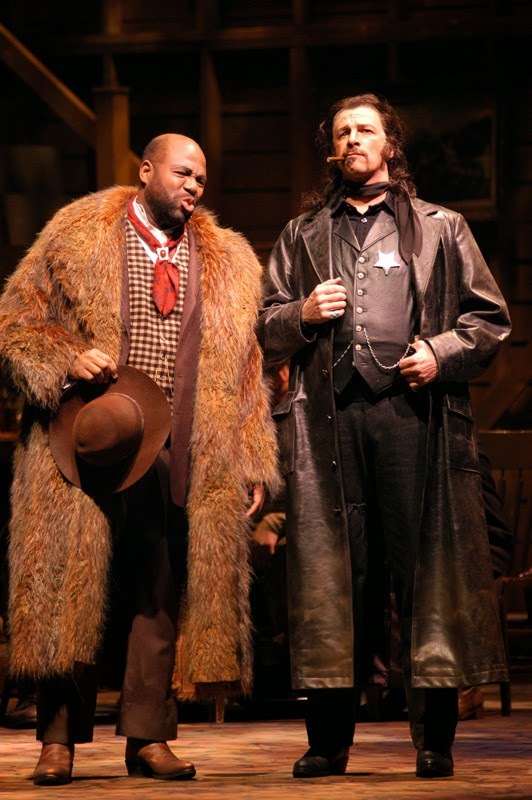 I was supposed to share the role, but the other fellow got sick, so Speight asked if I could do all the performances. I ended up singing 5 Telramunds in 7 days, including opening night and a matinee the next day. I was tired, physically, after that, but I remember saying to myself: “Okay...I think I can do this repertoire.” It was a fateful moment for me. 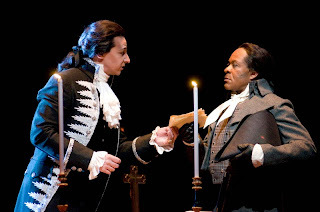 The next year, Speight had me come do Escamillo, that was fun. I love this little tango-move—that’s in the Toreador song, I’m pretending I’ve got the red cape, the muleta, and the bull is coming in very close. 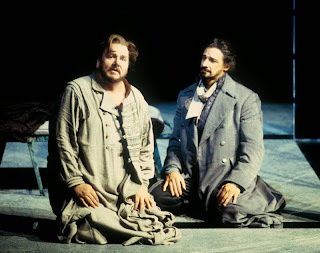 Here I am as Kurwenal, with Ben Heppner, on that amazing set for Francesca [Zambello]’s production, which was like being on board the Titanic. 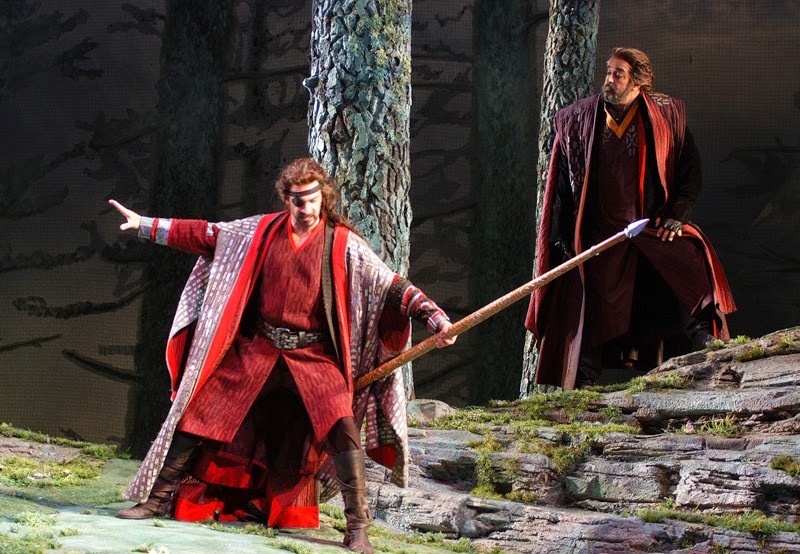 Ben and I had become great friends when we did Lohengrin, and here it really was a case of art mirroring life, because that was his first Tristan, and I was able to help him through the ordeal a bit as Kurwenal helps Tristan. Again it was Speight who said, “You need to sing Méphistophélès.” And I had such a great time! I don’t get to do this character often enough. There’s such humor in it. 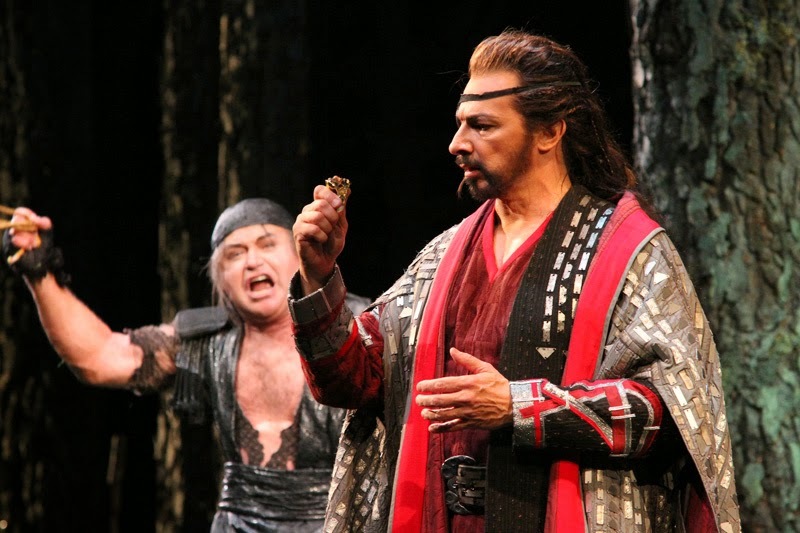 Bernard Uzan directed this production, and he gave me great insight into the character. It was really a gift, working with Bernard on this. This is from the first time I did Tosca in Seattle, with Carol Vaness. What an honor! It was a thrill to do it with her. I sang Donner and Gunther the first time we did the ‘Green’ Ring in Seattle. 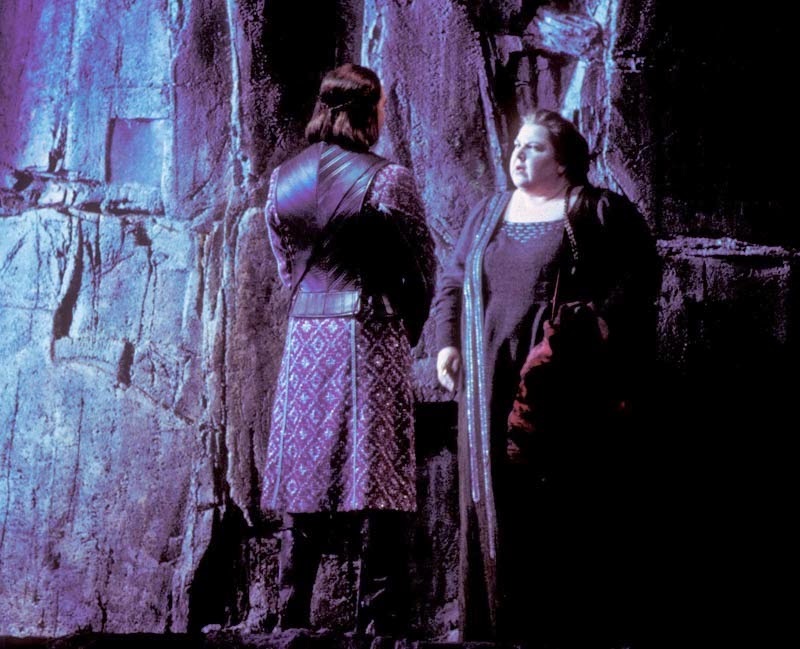 I love this scene, from the end of Act 1 of Götterdämmerung, because it’s supposed to look like Siegfried has transformed into Gunther, and it never does. 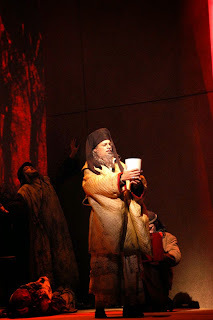 But [stage director] Stephen [Wadsworth] had the idea to let me mouth the words and have the tenor singing into a cut-out, he’s behind that wall. It worked brilliantly. One reviewer didn’t understand that it wasn’t me singing, and I got a review that in that scene my high notes were a little tight! 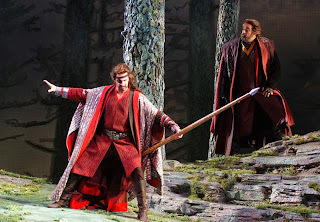 Parsifal, the first opera in McCaw Hall, was also a great production. 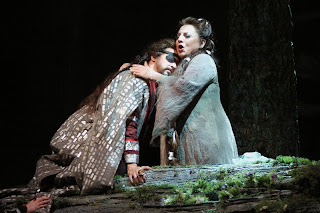 I haven’t sung this role, Amfortas, too often—they don’t do Parsifal a lot—but it’s a great role. Bob Israel’s designs were fun, as you can see—here I am holding the holy grail. I sang my first Jack Rance here in Seattle, too! I’ve done it 4 or 5 times since then. What American singer would complain about getting to wear a leather coat and a leather vest with a star on it and a sidearm! Every American boy wants to be a cowboy. Bernard directed this show, too. Ewa Podles was wonderful as Erda. She was really a very nice lady, I really enjoyed working with her. There’s Peter [Kazaras] as Loge, in 2005, the only time I did it with him. That was great fun. The very first thing I ever sang with Peter was Orpheus in the Underworld, in Santa Fe, a long time ago. At this moment I’m keeping everybody from running after Freia, who’s just been kidnapped by the giants. You have to get the spear at just the right balance point in order for that to work. And the way the stage floor is this uneven mountainside, my balance is always a little bit off anyway, so it’s hard to get it right. Plus, that coat is really heavy! There’s Tom [Harper] as Mime! We had a great rapport in that Riddle Game scene. He was a wonderful Mime. 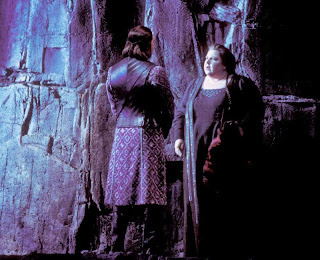 And there’s Jane [Eaglen], we’re doing Wotan’s monologue. I never think of the monologue as a solo piece of music, I think of it as a duet. Brünnhilde plays such a big role in it. I love this picture of us together—she’s there with me, through my pain. 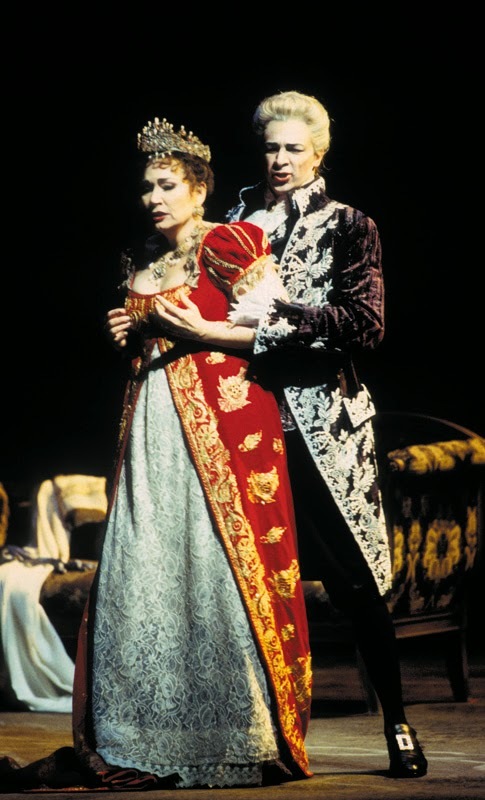 Here I am as Scarpia, with Steven Cole as Spoletta. I’m wearing the same coat I have on now, which still fits quite nicely! 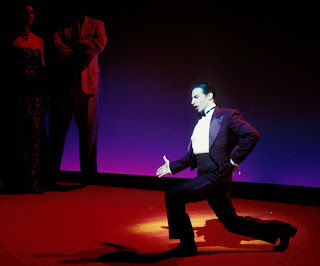 Steven was an amazing Spoletta. He played him so concentrated; everything was exact. 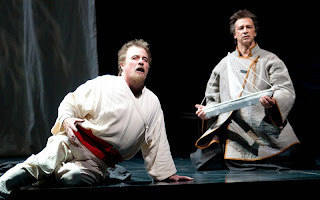 This is the Tristan und Isolde that Peter [Kazaras] directed, with Cliff [Forbis]! I’ve done a lot of Tristans with Cliff. I love singing Kurwenal with him—he’s a great colleague, and he sings the snot out of it. And he also is very in it—he acts it so well, he makes it easier for me. Chris Alexander updated Fidelio, setting it in contemporary Europe somewhere. 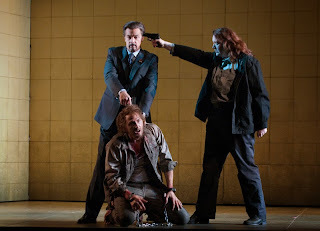 I’m getting ready to shoot Florestan here, but I’m stopped by Fidelio holding the gun to me. I’ve worked with Chris Alexander two or three times, I’ve loved it every time. Here’s a great moment: when I take the ring away from Richard [Paul Fink] as Alberich. I’m so focused on the ring, I don’t even notice that he’s there. Before the end of his aria, there’s one word he sings that shakes me out of the trance I’m in. just looking at this photo, I couldn’t tell you which year it was taken—we’ve been doing it together for ten years now! 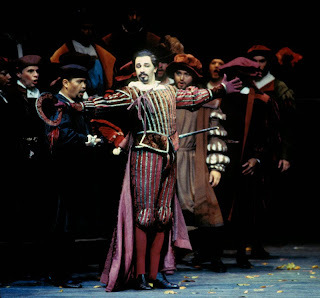 I've followed Greer through all these moments, especially loving him as Escamillio, missing only the Fidelio performances (my health issues, not his). 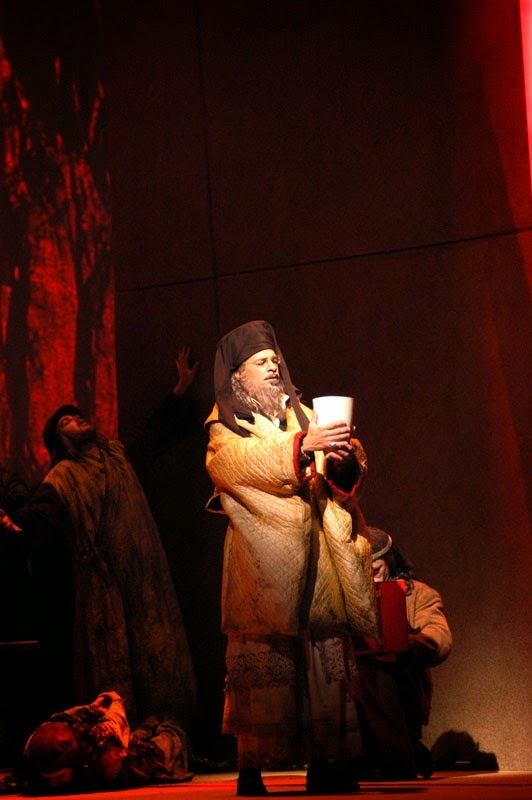 I love his Scarpia; he sings about lust against a Church background. What a terrific singer-actor. Seattle adores you!